Are you looking for a unique study abroad experience, to immerse yourself in a new culture and explore an exciting natural landscape? If so, study abroad programs in Nepal may be a great option for you. Nestled in the Himalayas in South Asia, Nepal is a developing country with a vibrant culture and history, a great study abroad choice for anyone interested in social and economic development, the environment, as well as a number of humanitarian volunteer and intern opportunities. Why Study Abroad in Nepal? 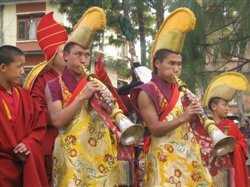 Predominantly Hindu and Buddhist, Nepali culture is unique compared to the typical Western experience, informing social customs, traditions and values. As a result, immersing yourself in Nepali culture is a valuable educational opportunity to see the world from a new perspective, learning how other people think and live outside if your own social experiences. If you are interested in learning more about Hindu and Buddhist philosophy, culture, and traditions, Nepal may be the place to visit. Nepali culture is also heavily influenced by traditional folklore. Many of Nepal’s social, artistic, and culinary traditions are heavily influenced by the region’s primary religious beliefs, Hinduism and Buddhism. The same is true for social values and lifestyle. For example, Nepal emphasizes forest and biodiversity conservation. As a developing nation, there are also many opportunities to get involved with humanitarian volunteer and internship programs in Nepal, as well as studying social and economic development. Study forestry or environmental science. Open to students with all skill levels,(no special equipment required) this class will cover the basic skills useful for outdoors photography and film, and then how to use these skills to tell stories important for conservation. By the end of the project, each of us will have acquired field experience in rich, important wildlife habitat; developed an understanding of the ecology, behavior, and habitat needs of key wildlife species; and much more.